Long time not post here, so here I am. I will post about my current OTP right now. Because of my tight busy schedule, I can not watch drama freely like before, so I just can catch up We Got Married, that only airing every Saturday. 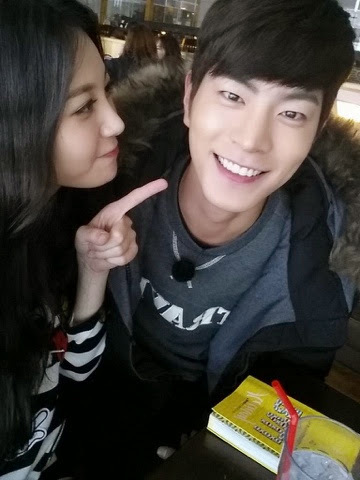 My current OTP is JjongAh Couple, Hong Jong Hyun and Kim Ah Young a.k.a Yura Girls Day. Yura uploaded these photos on her official SNS twitter account. Jonghyun uploaded this picture on his official SNS facebook account. 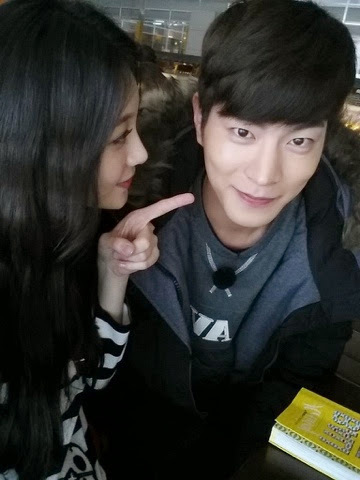 FYI, the story behind this upload photo already aired in We Got Married JjongAh couple episode 27, you must watch it for sure. Okay I will share their meeting so far, this all credit to soompi thread. 2nd meeting (May 29th) - Aired on episodes 2, 3 & 4 (14th, 21st & 28th June) : Honeymoon camping trip: Lunch at the rest stop, deciding on their pet name for each other, extreme water sports in the lake, bungee jumping, Yura broke that cockroach looking RC car, grocery shopping for the cooking contest, and the cooking contest itself. 4th meeting (June 30th) - Aired on episodes 7,8,9 and 10 (19th & 26th July, 2nd & 9th August) : The breakfast scene, Yura gave him the drawing, "art class" with pretty art teacher, outside date Ilsan, Turkish ice cream scene, watched 4D movie, double date (couple games in the pool as well as before dinner, lie detector game, honest talk) with the GoongJin couple, walk through the darkness. 5th meeting (July 11th) - Aired on episode 10,11, and 12 (9th, 16th and 23rd August): Finding out contest winner, Car date (McD & refueling gas), Itaewon date, visiting Hong Seok Cheon's restaurant, Itaewon date (strolled through Itaewon street, ate melon ice cream), visited Hera Park's jewelry store. 6th meeting (July 11th evening OR July 12th) - Aired on episode 10 (9th August): Jonghyun's surprise visit and snacks a day before GsD's concert. 7th meeting (July 19th) - Aired on episode 12, 13, 14 & 15 (23rd & 30th August, 6th & 13th Sep): Jonghyun going to Girl's Day's pre-recording at Music Core, housewarming party with GsD at the rooftop house, evening games. 10th meeting (October 13th) - Aired on episode 21, 22, 23 (25th Oct, 1st & 8th Nov): watched photobook contestants' videos, picked up winner, a stroll to JH's past (school & part time job), visit to the Zoo, Chimaek, hand massage on bed. 11th meeting (October 21st) - Aired on episode 23, 24 & 25 (8th, 15th & 22nd Nov): Yoga Class, meet-up with Jonghyun's close model/stylist friends. 12th meeting (November 3rd) - Aired on episode 25, 26 & 27 (22nd & 29th Nov, 6th Dec) : Ulsan trip; Lighthouse proposal, Lotte's Ferris Wheel, Meeting Yura's parents. 13th meeting (November 13th) - UNCONFIRMED WGM filming : Backstage MMA. 14th meeting (November 16th-18th) - Aired on episode 27, mostly not aired yet (6th Dec, ....) : Bali trip.